King cobras (Ophiophagus hannah) are diurnal reptiles that have the formidable status of being the world's biggest poisonous snakes. Although these snakes are daunting to opponents that get in their way, they do exhibit parental concern for their eggs prior to hatching. Reproduction of king cobras takes place between the months of January and April. King cobras are an oviparous species. This means that they lay eggs. Not all snakes are oviparous, as many of them are live-bearers, including boa constrictors. King cobra clutches generally consist of between 21 and 40 eggs. Some clutches can have a maximum of 70 eggs, however. Adult female king cobras set up nests for their youngsters. These nests are generally composed of dead foliage and leaves. High decaying temperatures incubate the eggs. Cobra mothers in general are usually extremely attentive to their eggs, but king cobras go above and beyond in this department. They assemble the nests by maneuvering the foliage and leaves with their heads and physiques. Once female king cobras are through constructing their nests, they carefully conceal them using additional leaves. They then curl their bodies around the nests to keep their developing eggs safe. Not only do the mothers look after the eggs, the fathers also stay in the vicinity, too, providing further protection. The males sometimes even handle physical protecting duties, parking their bodies onto the nests. Male and female king cobras never do this simultaneously. The young hatchlings generally exit their eggs once the autumn rolls around. Incubation typically requires between 65 and 80 days. When adult king cobras are monitoring their eggs and are in protective mode, they can be fierce to people who come near them, so be careful if you're ever anywhere they might be. Their venom is deadly. Although adult king cobras work hard to take care of their babies prior to hatching, their parenting duties are all done once the youngsters are actually born. When the babies hatch, they promptly depart from their nests and begin looking after themselves, as totally independent creatures. Newborn king cobras usually are between 18 and 20 inches in length. 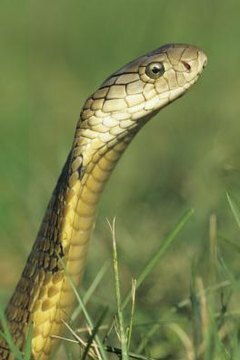 When king cobras are young, they have black bodies with lighter yellow or whitish markings.